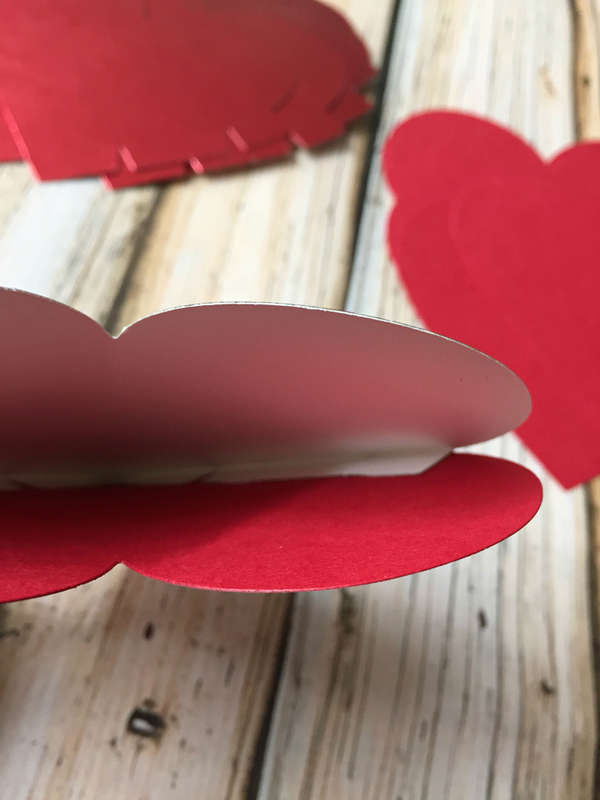 Create a Valentine’s Day Countdown Banner using your Sizzix machine, some pretty paper, and glue…it’s that easy! Want to start a new tradition? How about creating a DIY Valentine’s Day Countdown banner? Leave a treat or sweet note for your love in a heart pocket everyday from February 1st to February 14th. Choose some pretty paper and get crafting! The designs from Echo Park Paper Co and so fun and perfect for Valentine’s Day! For this project you will need Echo Park Paper Co Bigz Pocket Heart Die, Echo Park Bigz Love Silhouettes Die, and Echo Park Bigz Key to My Heart Die. I had some red metallic scrapbook paper left over from Christmas projects so I used that for the front of the heart pockets. For the backside I used Bazzill Ruby Slipper. Using the sandwich method (Cutting Pad, Bigz Pocket Heart Die, paper, Crease Pad) roll your sandwich through the Big Shot Machine until the whole thing has come through on the other side. Do the same thing 13 more times. You should get 6 hearts out of a 12×12 piece of paper. To make the backside of the pocket, cut 14 more hearts (using Bazzill Ruby Slipper paper) but cut the tabs off. Next, put glue on the tabs of the red metallic hearts as shown below. Place non-tabbed heart onto tabs and gently press together. While those are drying, cut out the rest of your pieces. If you keep scraps, now is the time to use some up! The silhouettes below don’t take much paper. I have lots of gold paper and I really don’t like to waste even small pieces. I found a piece big enough to cut out the Love Silhouettes. Use the sandwich method as mentioned above but instead of a crease pad you will use Cutting Pads. Set those aside and move on to cutting a lot of hearts from the scraps of paper you have left. Once the pockets are dry, embellish with the cute little Hearts, Banner and Key. Create a template using another piece of scrap paper and use it as a guide to punch holes in the back of the heart pocket. Once you have punched holes in all, string twine through holes. If all 14 hearts don’t fit in the space you plan to hang it you can always double up and do two rows. For each day you could leave a sweet note for your love or a little candy surprise. The silhouette of the man and woman reminded me of one of my favorite Brad Paisley songs,”All Because Two People Fell in Love” so I placed them in a pretty frame to represent my husband and me. I’m always grabbing my kids for a smooch so I created a cute little sign to sit next to a bowl of Hershey’s Kisses. You can download my Come Here and Let Me Give You a Kiss sign for FREE. I found a pretty gold wire frame for 80% off at Michael’s and thought it would be the perfect addition to my tablescape. Create a Valentine's Day Countdown Banner using your Sizzix machine, some pretty paper, and glue...it's that easy! Hang your Valentine's Day Countdown Banner on a table, mantle, or mirror and have fun filling the pockets with little treats for your loves! I hope you enjoyed my DIY Valentine’s Day Countdown Banner. Happy Crafting and Happy Valentine’s Day!